1. Have pillows to muffle loud noises if the noise of manifesting demons might be a problem (for example, in an apartment). c. Write down spirits discerned which may not have been dealt with when discerned. These may be used in future deliverance sessions. 3. Have paper towels and tissues for times when the spirits leave through the mouth, nose or by tears. 4. Sit close together, often with one person on either side of the one receiving ministry. 5. Under most circumstances do not pray alone because one can never been sure there will not be a violent manifestation. Have a team of at least two workers praying since discernment is a body ministry and often shared between those ministering. 6. Avoid men ministering alone to a woman without another woman present (and vice versa). 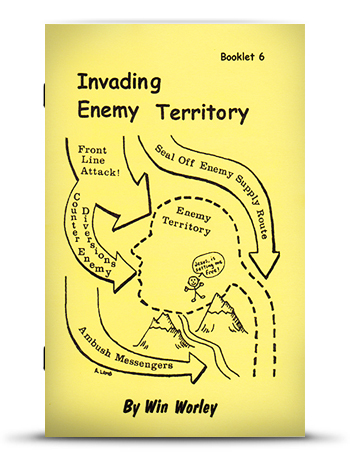 The above is an excerpt from “Invading Enemy Territory, Booklet #6″ by Pastor Win Worley. Copyright © 1983 by Win Worley, Revised © 1992. All rights reserved. No part of this publication may be reproduced or transmitted in any form or by any means, electronic or mechanical, including storage and retrieval system, without securing permission in writing from the publisher, WRW Publications, PO BOX 9309, Highland, IN 46322.